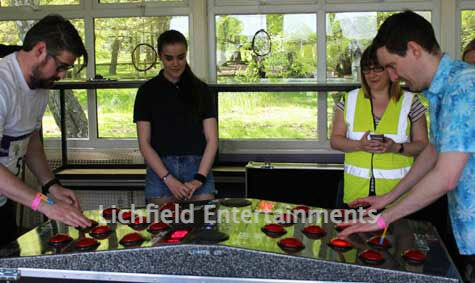 We have a range of five different reaction speed games for hire that will challenge the hand to eye co-ordination and reaction speeds of the participants. All provide competitive but safe fun and are ideal for promotions and brand activations, conferences, and indoor fun days. If required we can supply a magnetic leader board to keep track of the best scores and make things even more competitive. 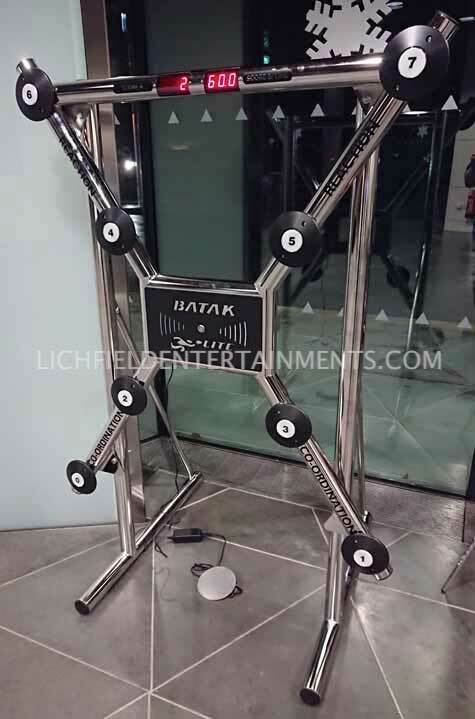 Batak Lite is a single player reaction speed game where the idea is to strike as many of the eight high intensity LED targets as you can within a set time limit. The difficulty level can be varied to suit the event participants and you can choose between 30second, 60second, or even a marathon 2minute game duration. Batak Lite needs an overall operating area of 4x5ft with a height of 6ft. 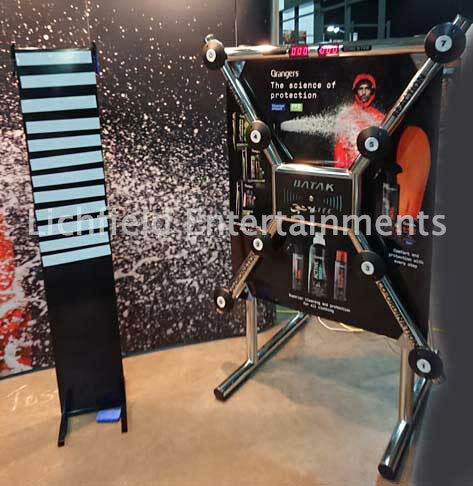 Batak Lite can be supplied with a branded rear panel and magnetic scoreboard to make the prefect attention grabbing exhibition stand activity. 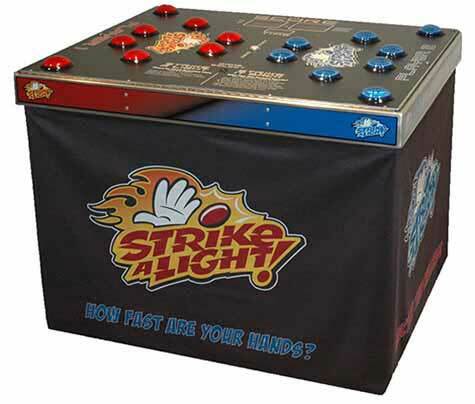 Strike a Light is a reaction speed game that is best described as a 21st century version of 'Whack-a-Mole'. It can be played by two players head to head or one player competing alone. When in two player mode you can choose between two different game types. In the Strike a Light game option it's a straight competition to strike as many of the randomly illuminating lights as possible in 30 seconds - you score one point for each light tapped but lose a point each time you hit a target thats not illuminated. The second game option is a two player game called Strike it Back. In this game you race to tap the randomly illuminated lights before your opponent does the same on their side, if you're first to strike it goes out on your side and lights up on the opposite players side. The first person to light up all their opponents lights is the winner. The game requires an overall operating area of 7x4ft and access to a mains electric socket is required. The game is suitable for use by ages 8 to adult. The Vault is different to the other four reaction speed games in that instead of aiming to tap as many targets as possible it's more about judgement and accuracy. Using a handheld trigger switch you have to stop the orbiting white light in a red zone. 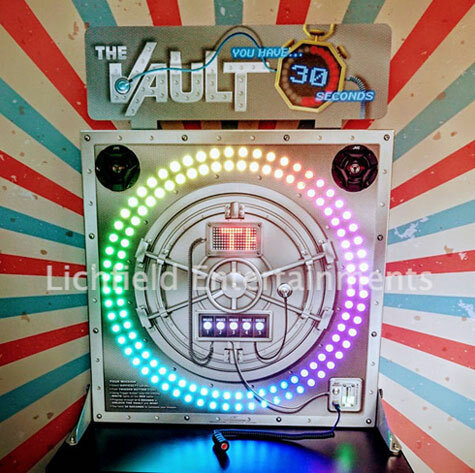 Each time you successfully stop the light in a red segment you pass through to the next round, successfully pass through five rounds and you 'open the vault' and win! It sounds simple...but in each round the orbiting white light gets quicker and quicker, and the red zones get fewer and smaller and you only have 30 seconds to succeed! The level of difficulty can be set to one of four levels so you can make it as challenging as you like for participants. Light Chaser is a 360 degree interactive reaction speed game for one player at a time. The player stands in the middle of the four pillars each of which has three illuminating reaction pads. 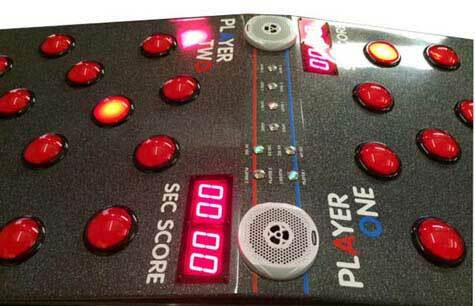 Upon pressing the start button overhead they then have either 30 or 60 seconds - depending on the requested game setting - to touch as many of the twelve pads as they can as they randomly light up. The further you get into the game the quicker the lights change. A countdown timer is on the front of the game so everyone can see the time ticking down and the current score is also displayed. This game requires a level operating area of 6x6ft with a height clearance of 9ft. Lights Out game - This reaction speed game can be played by two participants playing head to head against each other or one or two players playing individually. It can be set to either 30 or 60second games and it has three different difficulty levels to choose from. There are eleven targets that illuminate randomly over the set time period and you need to tap as many as you can. 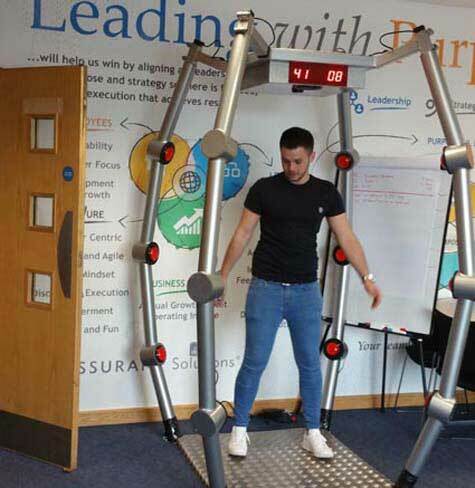 If you have any queries, questions, or would like to hire any of our range of Reaction Speed Games for your event please click here to enquire and we will do all we can to help.